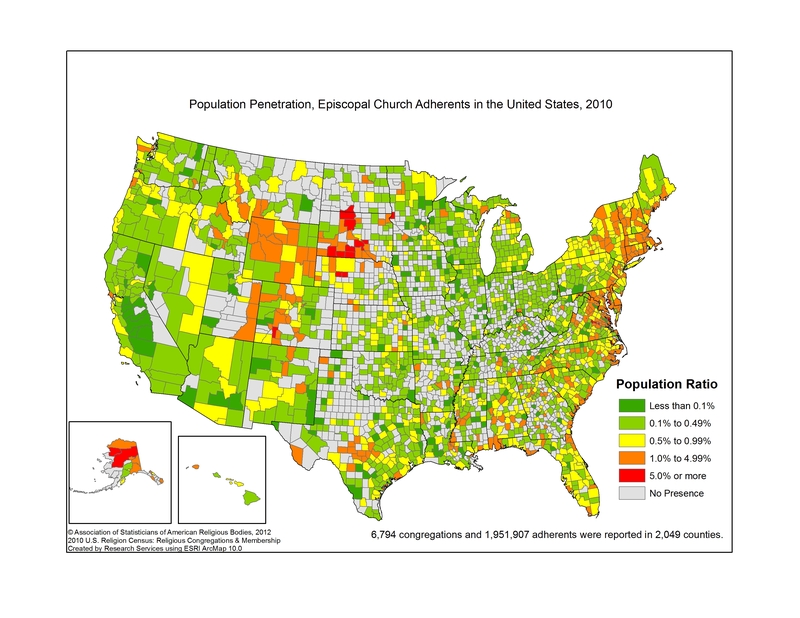 So, red is the highest population of Episcopalians (mostly around Native American reservations), clocking in at 5% or higher of the population. Then you get a nice smattering of oranges in the traditional East Coast bases of the church. But even there we are only talking about 1% to 4.99% of the population. Then the yellows and greens (like where I live in California) show where less than 1% of the population is part of the Episcopal Church. Then take a minute and look at all the grey area. County upon county where the Episcopal Church is not present. Sure, you can point to the middle of the country and say, well, no one lives there. But that would be a lie. And you see many counties with solid population centers. The Episcopal Church just is not there. Some would look at this map and see a map of the decline and near-collapse of the Episcopal Church. I look at that map and see a great option for the mission of proclaiming the Anglican way of living out the Gospel of Jesus Christ. I don’t see decline. I see new opportunities for ministry and mission. Singularity University: meet the people who are building our future | Technology | The Observer. I have been thinking about this article I read last Sunday. In particular, what does the impending massive technological change in which AI adances rapidly and technology becomes part of our body mean for religion? In my context of teaching in a seminary, I am especially curious about what sort of competencies will be needed. And how will the spiritual life inform these changes? Or will spiritual practice begin to look different as well? Has anyone else read on this topic or have thoughts on it?